Sometimes, I have a lot to say about a paper doll set. Other times, not so much. This is falling into the not so much category, as are most of my posts this week. Sorry. I just don’t have that much to say about these paper dolls. When it came to coloring today’s paper doll, I decided to go a little cliche and just do blue eyes and blond hair. Of course, there is a black and white version you can color anyway you like if you’d prefer a different combo. For Ruby, I chose to go very casual with her shoes. Mostly, because the other version of Ruby has such formal shoes. I figured she didn’t need another set of super formal shoes. Her hair was my attempt to practice drawing short hair. I love pixie cuts, but I don’t draw them much. Specific Source Images: This hair & these sandals. 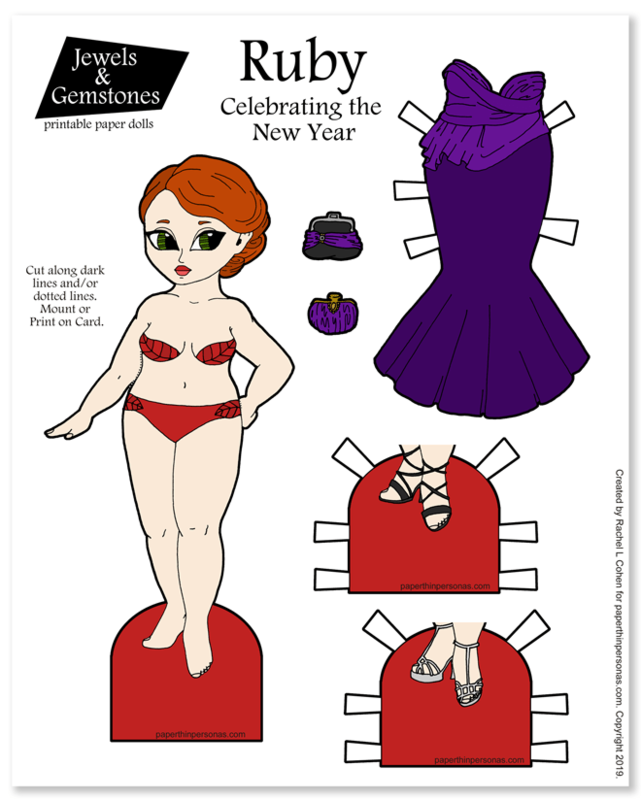 On the Blog: More Jewels & Gemstones Paper Dolls and my formal version of Ruby from January. Around the Internet:All my hair sources tend to come from my Hair Pinterest Board. I do also use hairstyle magazines as well. Totally unrelated to paper dolls, but I’ve been binge watching Umbrella Academy on Netflix. I have two episodes left. It’s so fun! I find the exploration of how messed up having super powers would probably make you super interesting even if some of the content is a bit cliche. Also, if you love the blog and want more paper doll content there’s Patreon. You get extra paper doll content and fun perks like polls and things. I try to walk a line between being specific in each of my paper doll designs and being general. So, today’s formal gown and shoes are both coordinated, but I chose colors and styles that could be worn with other future evening wear. I don’t have any more paper doll evening wear yet, but I will eventually. It’s not like this is the only paper doll with an evening gown I plan to draw ever. Plus, I think her hair style could be either steampunk or wedding or evening or… there’s a lot of options in that hairstyle. Also, can someone explain to me why evening clutches are always too small to actually hold anything useful? Sometimes a girl needs more than just lipstick and her phone. The name Ruby, because that seemed so fitting for a redhead paper doll. Cliche perhaps, but I can live with that. Plus I do love redhead paper dolls. Always have. Something about New Years always makes me think formal gowns and when it comes to formal gowns, I love gowns by Marchesa. I hope everyone who has today off is having a lovely New Years day. There is unique content on Patreon, including a totally an exclusive Friday paper doll. As always, I love to hear what folks are thinking in the comments. Do you love redhead paper dolls as much I do? 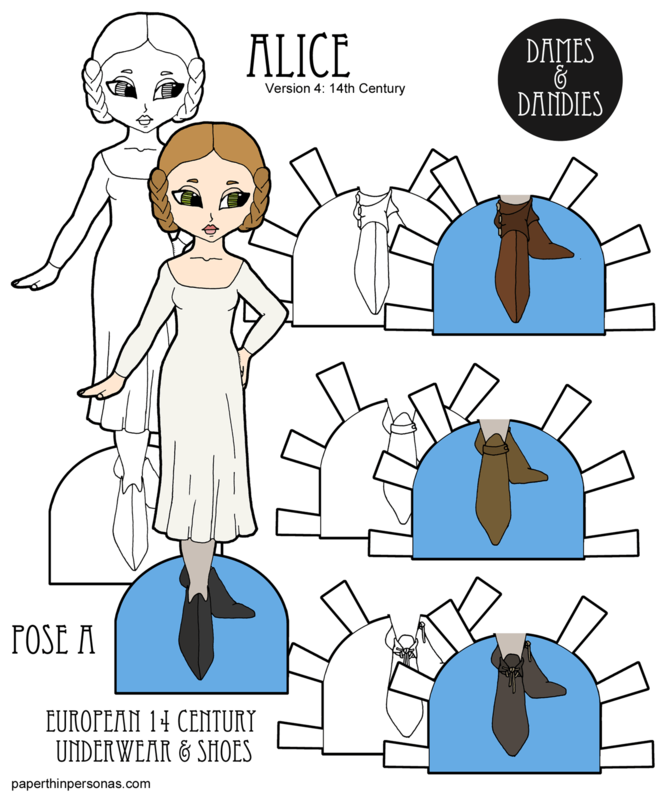 Printable Black & White PDF Printable Color PDF More Paper Dolls & ClothesI have had several requests for early fashion history paper dolls and this week I am sharing a whole week of 14th century clothing from Europe. This is not how they were dressing in the Yuan and Ming Dynasties of China, for example. Though someday maybe I’ll feel confident enough to try out historical Chinese dress (it’s really interesting). The 14th century is one of the last eras in which women could get away with having their heads uncovered which I think is kinda nice. Her hairstyle was based on manuscript illustrations like this one and busts like this one. Her shift is a bit more fitted than they probably would have been in the real world, but that’s because paper dolls don’t have the benefit of fabric and the layering gets to be an issue. It’s based on one of the few shifts I could find in manuscript illustration. It comes from Roman de Giron the Courtois which is a manuscript held in the National Museum of France under the call number NAF 5243. The illustration I used is on folio 87v. It’s also on a few other pages as well. Her shoes all come from the excellent, though rather dry, book Stepping Through Time by Olaf Goubitz. It took me months to find a copy at a reasonable price, but it’s an excellent source full of drawings of archaeological footwear finds. If you know, that’s your kinda thing. As always, a big thank you to my Patrons and if you’d like to help out the blog by making a donation, you can do that over on the Patreon page. Also, I’m doing a poll! I posted this on my Patreon page, but I didn’t get a lot of responses, so I am hoping if I post it here I might get more. Plus I know Monday is my highest traffic day. Should I continue the Dames & Dandies into 2019 or do a new annual project in 2019? No, I'd love to see something new for the next year. Yes, there's so many more things for the Dames and Dandies to Be. As always I reserve the right to ignore the outcome if I feel like it. 🙂 Anyway, enjoy today’s paper doll and if you have a moment, let me know what you think about 2019. Printable Black & White PDF Printable Color PDF More Paper Dolls & ClothesThe first two Bridget paper dolls were both red heads. I do love red headed paper dolls. I blame it on reading Anne of Green Gables as a young child. Anyway, I felt like poor Bridget deserved a non-redhead version, so I designed these two dolls to a a blond and a brunette. Also, the other two Bridget paper dolls both have fairly straight hair. Therefore, these two have curls. I am trying to increase paper doll diversity after all and I can’t exactly do that if I just draw the same style Bridget paper dolls every time. What I don’t have yet is an “unusual hair color” Bridget, so I guess that’s next up for her someday. Maybe blue or green hair… I’m not sure. I haven’t crossed that bridge yet. What hair color would you like to see for Bridget? Let me know in a comment! I love to hear from you. And also, if you like the blog, consider supporting it through Patreon. It really does help keep my costs down, because the internet is not free and I won’t put ads on the site. Even a dollar a month helps. Join here if you want too. Oh, and if you aren’t aware, I’m doing a curvy paper doll for Inktober. My goal is ten drawings for the month of October. and I’m sharing her to Instagram as I get her done. You can follow me there or follow the tag #ptptinktober to see my drawings. Two other people are doing paper dolls too on Instagram- @enolablue_ooakdolls and @elizabethjoymcdonald. Miss Missy is posting her Inktober paper doll on her website. Need clothing for today’s paper doll? All the B Pose Dolls & Clothing. Because the first Alice was a blue eyed blond, I decided it made sense to make a green eyed brunette and a brown eyed red-head made sense for my next two Alice paper dolls. There’s also 18th century Alice, but she’s a bit unique, because she can’t share clothing with all of the other paper dolls. So, I’m not sure if I can count her, really. The whole point of this “double-set” thing was to try to expand the number of dolls available quickly, so people would have variety. But I also have to remind myself that I can’t compare the Dames and Dandies to my other series. It’s only been around for nine months after all and things like Marisole Monday ran for years. Instead, I am trying to think- If I could “start over” knowing now what I didn’t know when I began this blog all those years ago, what would I do? And I am trying to be smarter than I was the first time. I like to think I am older, if not wiser than I was. So, anyway, that means that this week will be all double-sets. So, we’ll have 2 A pose and 1 B pose. I know the C pose is being neglected and I do feel bad for the guys, but I can’t fit two of those dolls on a single sheet as far as I can tell. So, they’re going to have to wait, but fear not- I have a steampunk version, a fantasy version and an elf all in progress for them, but until then- enjoy the A pose dames and their shoes. And if you love the blog, than please support it through Pateron, follow me on Social Media or leave a comment. I love to hear from y’all. Printable Black & White PDF Printable Color PDF More Paper Dolls & ClothesThe first version of Bridget was made for St. Patrick’s Day. 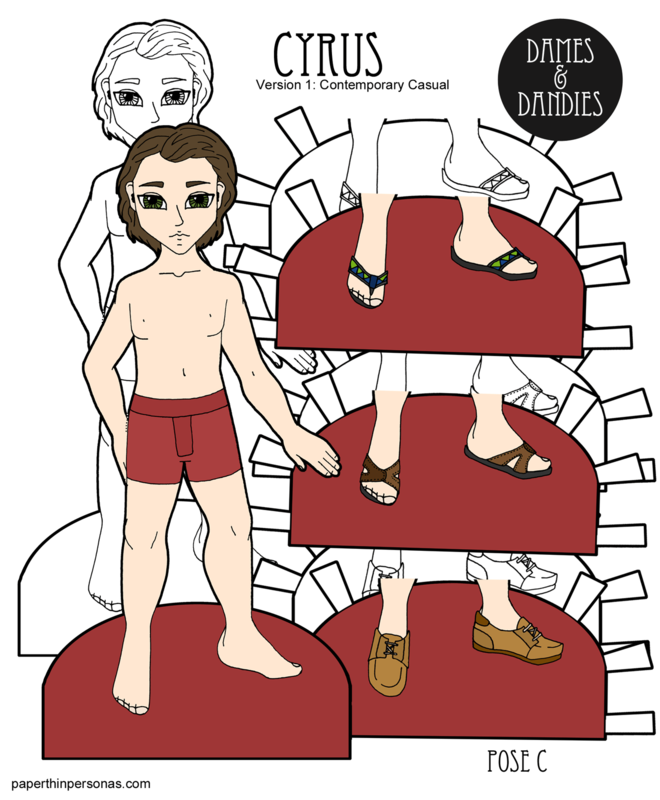 I knew though that I wanted a second version of Bridget with sandals as I have done for all the other Dames and Dandies paper dolls. Why sandals? Well, because sandals show off a lot of skin. Skin-tone is the one thing about paper dolls that limits some of the mix and match possibilities. I call this the “shoe problem” and its an issue I’ve never really found a good solution for. So, until I figure out a better way to solve it, I try as much as possible to make many shoes for my paper dolls. That way, the paper dolls will always have a shoe that matches the outfit. These are the problems those of us who draw paper dolls really dwell on. I talked at lot about this a few years ago when I wrote this post on Playability. It was part of a series I did on drawing paper dolls, mostly from a theoretical perspective. Love the paper doll? Not sure about the paper doll? Let me know what you think in a comment! I love to hear from you. But since this series is only three months old, I’m settling for just trying to get a variety of human skin-tones and then branching out. Don’t worry, I plan to create my fairies and aliens soon. I’m just not there yet. So, today I’m pleased to introduce the first white C Pose Dandy. This is Cyrus. I went through a bunch of names for him before I settled on Cyrus. I originally was going to name him Chester, but I decided I didn’t want another ‘Ch’ name. Now that I have a set of four C pose guy paper dolls finished, you can expect to see some more versions of them soon. I really want to do some elven versions with pointy ears and some pirates and maybe a cyborg or two. This is all in the planning stages, so it might be a while before I can roll them out. Wednesday, there will be some steampunk action for the A Pose Dames and then some medieval fantasy fun for the B Pose Dames. I finally have enough backlog to feel comfortable and I am some much more relaxed. Let the paper dolls continue. And, of course, I always love to hear from you, so leave me a comment.